Very young children between the ages 0-2 begin their High Bank journey in our spacious baby room. The room has integrated facilities, including an eating area with high chairs. An adjoining quiet sleeping area, with cots, ensure your child can sleep peacefully throughout the day and not be disturbed by those who are awake. We also follow the weaning process to complement what you are doing with your child at home. All the equipment and resources in the baby room have been specially chosen to help your baby’s stages of development. At this stage the emphasis is very much on play, but learning experiences are introduced subtlety to allow your child to flourish during the vital years of discovery. We only use natural materials and the room is set out to be a sensory adventure for the children, including soft toys, furnishings and different textures. When your child starts in the baby room, with your help we create a learning journey book for them. 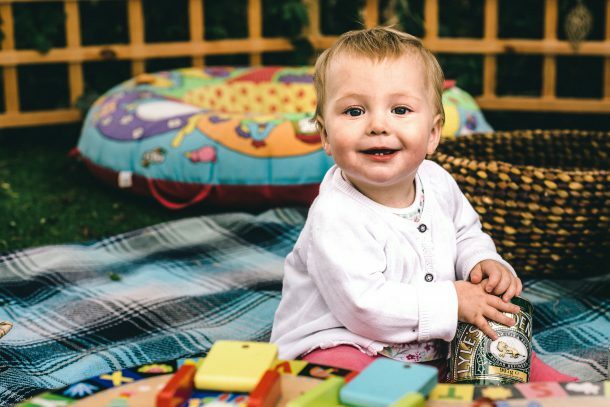 At this stage the book allows us to get to know your baby’s likes and dislikes, any special dietary requirements, allergies and any other information that will help us to make your child’s transition to nursery as comfortable as possible. At the end of each day, when you come to pick your child up, a member of our baby room team will provide a verbal report and you will also receive an electronic report, delivered by an app to your mobile telephone, tablet or computer. This report includes pictures, audio and even video. When your child is ready to progress – we will decide this with you once they are physically and emotionally ready – they move into the adjoining ‘rising 2s’ room. This room is accessible from the baby room, so your child will have become used to seeing what the ‘bigger’ children do in the room. Whilst play is still the focus of the day, more learning experiences are introduced at this stage. Activities are designed to offer the opportunity for your child to explore large movements, vision and manipulative skills, hearing and speech and social and spontaneous play. There is a quiet area within the room for your child to sleep and this is generally done as a group to ensure everyone gets the rest they still need at this stage in their life. Children eat their meals together and begin to learn how to use cutlery and display appropriate table manners. Staff continue to fill in your child’s learning journey and note any observations related to their development. At the end of each day as well as being given a verbal summary of your child’s day by a member of staff, you will also receive an electronic report, delivered by an app to your mobile telephone, tablet or computer. This report includes pictures, audio and even video. When your child is ready to progress to our Toddler room a moving rooms form is completed and the room leaders undertake a detailed handover prior to this move. Your child’s key person will also visit the room with them to enable them to have a smooth transition.